Already labeled as a ‘summer smash’ by Radio’s 1’s Annie Mac, alongside clocking up hundreds of thousands of hits on YouTube, the next Drumsound & Bassline Smith single ‘Through The Night’ could be their biggest hit to date and a fitting lead into their new artist album project. Earlier this year Andy Wright, Ben Wiggett and Simon Bassline Smith aka Drumsound & Bassline Smith hit the UK top 40 with their co-production of Utah Saints’ ‘What Can You Do For Me’. Although the D&B trio are no strangers to mainstream success, with their last two singles ‘Freak’ and ‘Close’ riding high on the Radio 1 airwaves last year and the latter scooping up two accolades (Best Track & Best Video) at the Drum & Bass Awards 2012. 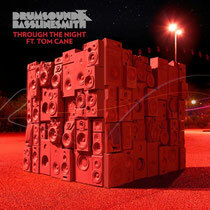 ‘Through The Night’ is taken from the forthcoming album ‘Wall Of Sound’ and features the vocal talents of newcomer Tom Cane. Combine this with slamming basslines, punchy percussion, sawing guitar riffs and epic breakdowns to create a truly ‘widescreen’ sounding track. Remixes come from across the EDM spectrum including Grammy award winning Bare Noize, whose rework has received over 500K views on YouTube and been heavily supported by Skream & Benga, plus Marco V, 501, The Shadowchild and Horx & P3000.